MobiPOS allows multiple device/terminal to work together as long as they are under the same Wi-Fi network. Generally there is a main iPad acting as a server, and all other secondary device retrieves and send information to the main iPad. In this guide we will focus on the setup of the main iPad. 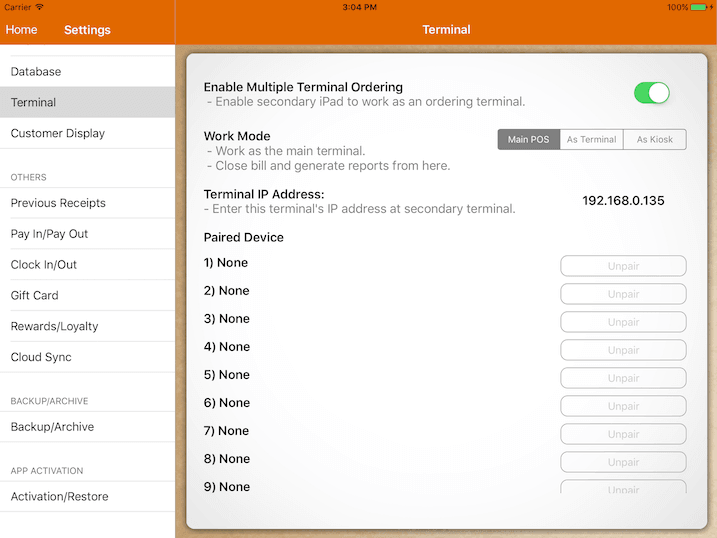 In order to enable multiple terminal ordering, you are required to purchase either iPad Terminal or iPod Terminal license. Upon purchase, switch on Enable Multiple Terminal Ordering. As this is the primary device where you store all your stock files and settings, set it as Main POS. That's all you have to do in the main iPad.